The other day I was at an estate sale in Skagway and picked up this old postcard. After doing a little research I found that the author was indeed related to Bud Matthews who recently passed away here in Skagway. Ernest J. Matthews was born about 1893 in Idaho. He married Catherine A. Lowe from Utah and they moved to Skagway around 1924 when their first son was born, James, known to everyone here as Bud. 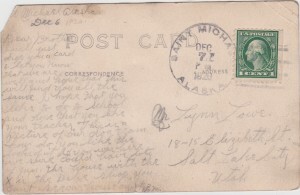 The card is signed E.M. and was written on December 7, 1920. Certainly all of Goyne family members deserve their own posting, but I will start with the most famous – Walter James Goyne. Born on May 29, 1897 in Pendleton Oregon, as a baby, he was taken to Skagway in 1898. His father, Francis (Frank) took his whole family to Skagway – wife Hattie, his son Hillary born 1895 Oregon, Ida Evaline born 1888 in Tillamook Oregon, Mabel Florence born 1893 in Tillamook Oregon, Stella Grace born 1896 in Tillamook Oregon, not to mention his Dad, William, born 1838 in Ontario. So, with all the kids, wife and dad in tow, they made it to Skagway to find that Hattie was pregnant again. 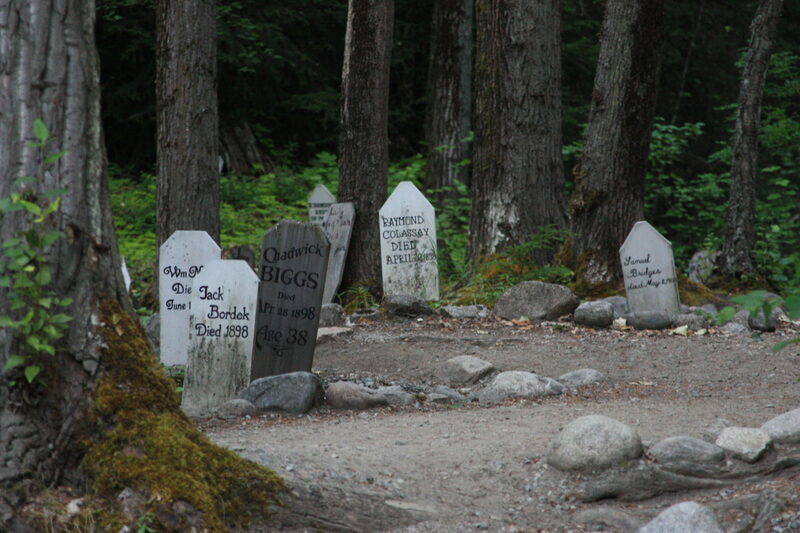 She bore son Lynn on August 28, 1899 in Skagway. Hattie and the kids moved to Dawson to be with dad in 1900. Another sister, Nugget was born in Dawson in 1901. Dad Frank had been delivering the Dawson Daily News on a 300-mile run in 1904. Although Lynn and his dad Frank stayed in Alaska, Hattie and the kids moved back to Oregon where she divorced Frank and remarried in 1909. DOG TEAM STILL HITCHED TO SLED AND THE MAN STILL SITTING UPRIGHTSearching parties have found the body of Walter Goyne, famous American dog derby racer, who was drowned, Nov. 15 when he went through the ice on Moose lake with his dog team. Through the transparent ice the body could be seen in eight feet of water sitting bolt upright on the sled, partly covered by an eiderdown robe. stretched out in front in perfect alignment were the nine racing dogs. The provincial police who investigated the accident, said they believed Goyne was traveling at racing speed toward shore in an effort to escape thin ice, when he plunged through and under heavier ice, where escape was impossible. 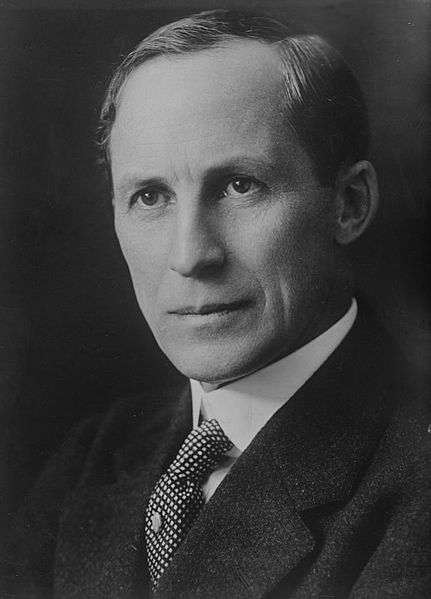 The first annual race, in 1916 was formulated by Grant Rice, editor of The Pas Herald of the era. 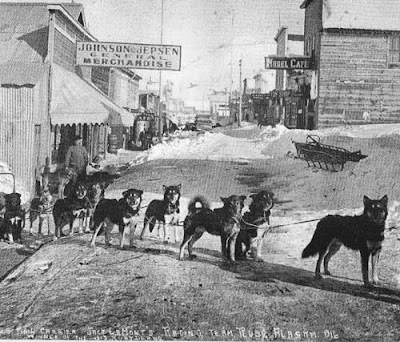 In the race of 1920, Walter Goyne, who was born in Ruby, Alaska, made history when he came out of the frozen hinterland of Alaska to compete in the early Le Pas Dog Derby. 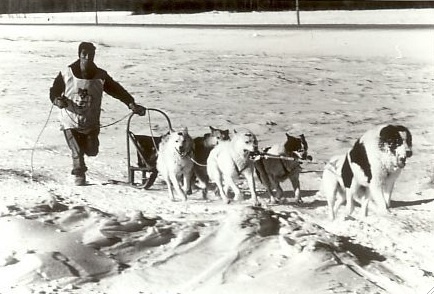 When Mr. Goyne arrived in The Pas that day many years ago, he discovered that all the local mushers were using an old style toboggan for racing, with their dogs hitched in tandem style. Goyne brought with him the famous Alaskan dog sled with his dogs hitched in the now famous Alaskan hitch, that is, dogs are two abreast with the leader centering the team in front. Northern Manitobans of that era were quite skeptical of Goyne’s sled and “new” hitch and in fact gave him little chance of winning that race of 1920. But when the race was over, and Goyne had won by an easy margin, the skeptics were forced to eat humble pie. 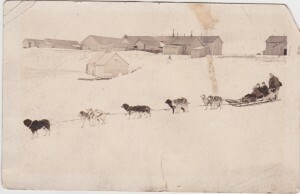 Today Goyne’s Alaskan hitch and sled is being used by all famous mushers in Northern Manitoba, the East and the St. Paul Winter Carnival whose dog races date back to 1889. The race of 1920 which Goyne won with ease, will always be remembered as one the Northland’s greatest. Consider the fact that Goyne had a crippled foot which forced him to ride on the sleigh more than his rivals thought best in a long grueling non stop race. You see unlike today’s race, which is broken up into three daily laps, in Goyne’s time it was 140 miles to Cranberry Portage or Flin Flon and back non-stop. Another item Goyne introduced to the North was the parka. Before he came to The Pas, the parka was unheard of. It was while visiting at the home of Mrs. E. W. Bridges that the parka was first introduced as the only type of winter clothing to adequately protect the upper part of the body from the freezing winds of the Northland. Mrs. Bridges took Goyne’s parka and using it as a model she made smaller replicas for her own children, one of whom later made a great name for himself in dog racing in The Pas derbies and those staged in the east. His name, Earl Bridges. Today the parka is a standard part of every northerner’s winter wardrobe. Arthur O’Leary’s traveling companion, Ben Olcott has quite a story of his own, which I will summarize here. Also born in Keithsburg, Illinois, Ben left earlier on his adventures west and in 1891 at the age of 19 moved to Salem, Oregon. He seemed to find Oregon his new home base from which he forayed to parts north to search for adventure and gold. After his 1898 trip with Arthur, he returned to Illinois to bank briefly and then headed back to Alaska in 1904. His journey ended notably when he drove a dog sled team to Nome, a trip of over 1,000 miles up theYukon and Tanna Rivers in the height of winter. Settling in Fairbanks, Olcott found work as a gold dust teller, and later a bank branch manager. He managed to make a sizeable profit from gold prospecting, allowing him to move back to Oregon. 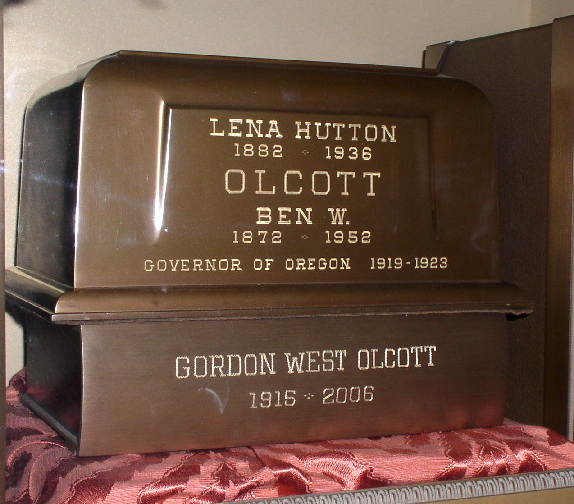 Olcott became involved in Oregon politics because of his brother-in-law Oswald West and so found himself succeeding Governor Withycombe in 1919 who abruptly died of a heart attack only two months after being elected. Olcott served as governor until 1923 until he was defeated by the Ku Klux Klan candidate, Walter Pierce. Olcott went back to banking, first to Long Beach, California and then back to Portland. He died in Portland on July 21, 1952, and was interred in Mount Crest Abbey Mausoleum in Salem, Marion County, Oregon. He may have been pictured in the photos of Arthur O’Leary below, but here are his portrait and gravestone. 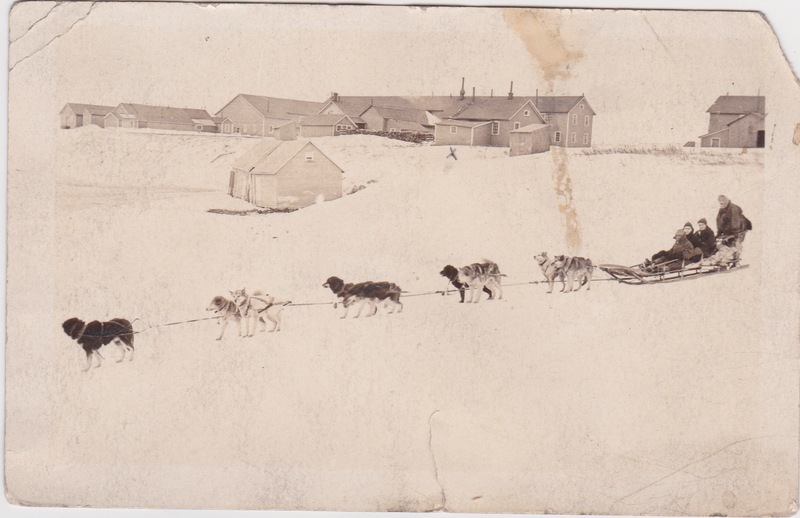 Here is another picture of that dog and his friends at Dyea in the winter of 1897. Is that a horse or a donkey? This picture taken in the winter of 1897 and processed on December 10, 1897 shows some goldrushers with their dog on the Chilkoot Trail. It looks like a rather large dog, perhaps a lab or cross. I wonder if he made it to Dawson! I call this blind faith, but really, would you cross this crevasse on this snow bridge? This was taken in 1947 at Mt. McKinley. Not sure if this is Skagway, but it sort of looks like it. The sign says Mascot, perhaps the Mascot Bar on Broadway, but quite different. Seen above is a dog team at Ruby, Alaska in 1916. A researcher just emailed to me this wonderful photo of two Moore family members on the Railroad dock. 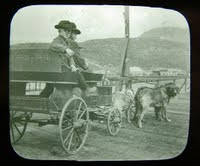 Note the lettering on the back of the seat that says “Moore’s park” and the dogs pulling the little wagon. I remember seeing other photos of this wagon, but this is the first time I’ve seen this photo. I think that the boy is James Bernard Moore Jr. known as “Benny”. He worked for Columbia Motion Pictures in L.A. and died there in 1960. He was born in 1891 which would have made him about 7 in 1898 which would match the photo. I would assume his dad is driving the wagon, also named James Bernard Moore. 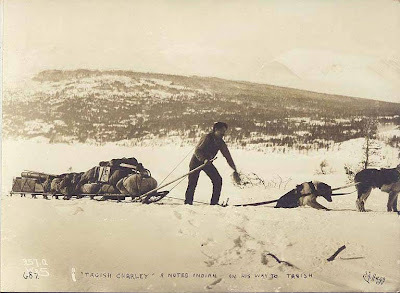 Tagish Charley or Charlie was born about 1865 in Tagish. He was a noted packer as seen above in this Hegg photo. His native name was Yeil Saagi Yelidoogu Xoonk’I Eesh. His wife was Nadagaat. Tagish Charlie, who later became known as Dawson Charlie, was Skookum Jim’s nephew. Patsy Henderson was Charlie’s brother. He guided early parties, but was not involved in the discovery of gold (that was Kaa Goox). Tagish Charley was a member of the beaver clan. He drowned in Carcross on November 15, 1905 and is buried there.